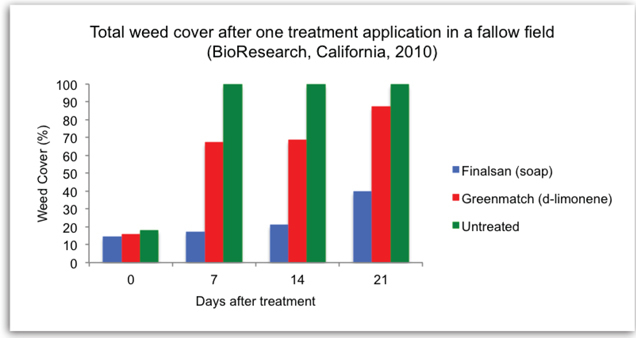 Finalsan Non-Selective Organic Weed Killer is a patented fast-acting weed, grass, algae, and moss killer. Using a specially formulated, non-staining, ammonium soap of fatty acids, Finalsan is a non-selective herbicide that controls or suppresses many common annual, biennial, and perennial weeds. A great alternative for RoundUp®, glyphosate or other synthetic weed killers! 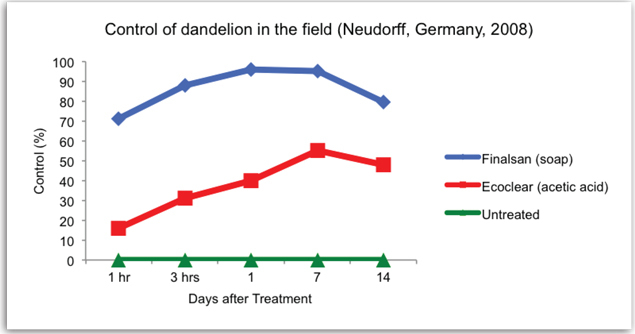 Herbicidal soaps work by penetrating the waxy cuticle of plants, causing the plant to dehydrate and die. The active ingredients accumulate in plants and cause intracellular damage, leading to cell death. Activity is non-selective and will kill plants the soap comes into contact with, but will not translocate to underground portions of the plant or harm the bark of mature, woody plants. 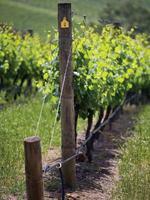 Can be safely sprayed around the base of trees, shrubs, hops, grapes without worry. Liquid selective herbicide that effectively and selectively kills broadleaf weeds in the lawn. Effective even in cool weather. Works fast and weed control can be seen in the same day. People and pets can enter treated area when spray dries. Use on weeds within vegetable and flower gardens, landscaped areas, lawns (for spot treatment only), in the vicinity of small fruits and fruit trees, around and on buildings, sidewalks, fences, bark mulch, driveways, patios and gravel. Use on moss and algae, around and on buildings, roofs, decks, sidewalks, fences, bark mulch, driveways, patios and gravel. Can be applied in cold weather when other organic weed killers may not work. Plant damage will be visible from a few hours to 2 days after spraying. Repeat treatment every 2 to 3 weeks to control new weeds growing from seed and re-growth from bi-annual and perennial weeds. 2.5 Gallon Jug (covers approximately 12,500 square feet).